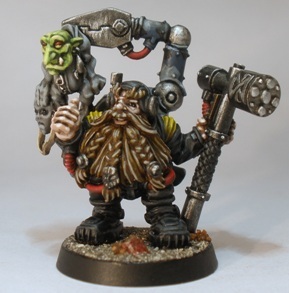 This cheerful looking guy is the only Squat miniature that Games Workshop has made since they quietly retconned the race out of existence in the mid-nineties. The figure was exclusively available to White Dwarf subscribers in 2010 and represents an incarnation of the magazines mascot, the White Dwarf himself. Seeing as dwarfs in space suits are the toy soldiers du jour at Sho3box Towers I tracked this peculiar but beautifully sculpted and cast miniature down on Ebay a week or two ago. I painted the figure to match the colour scheme used for the rest of the Ursa Miners. The contrast in the photo did something weird to the figures beard, it looks less chalky in real life, honest.